You may be familiar with the general rule of thumb about stretching – stretch a few minutes before your exercise to warm up and a few minutes after to cool down. 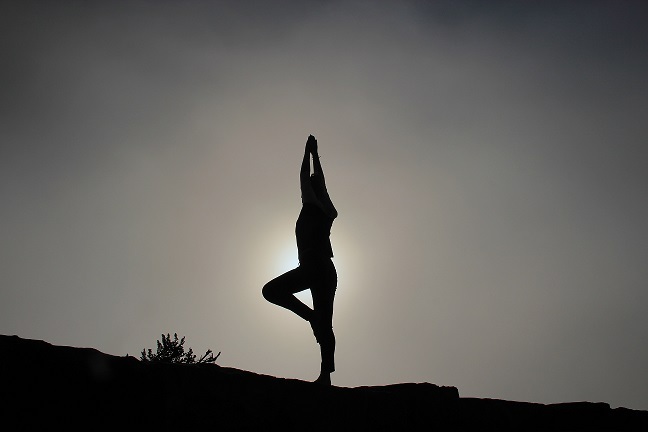 If you are new to stretching and exercising, chair yoga is a good place to start getting comfortable with strengthening your muscles and improving flexibility. If you do exercise regularly, chair yoga is a great practice for maintaining flexibility and energizing your body. If you would like a visual aid to keep as a reminder to stretch each day, Carl Dawson’s Chair Yoga uses cute stick figures as a “how-to” guide with 17 easy stretches that do not require a yoga mat or any fancy equipment. I have always kept this picture taped on the wall above my office computer so that it is easy to remember to stop and stretch throughout the day. Chair yoga poses can be done before or after exercising, in the morning as an energizer, during the day to encourage mobility, or before bed to relax and de-stress. Depending on the height of your bed or your level of flexibility, some of these poses can also be done on or beside your bed for support. As I prepare for bedtime, I like to do the following relaxing poses using the bed instead of the chair: Hip Opener (outer), Shoulder Stretch, Knee Bends, Dog Pose, Hamstring Stretch, Lunge, and Tree Pose. 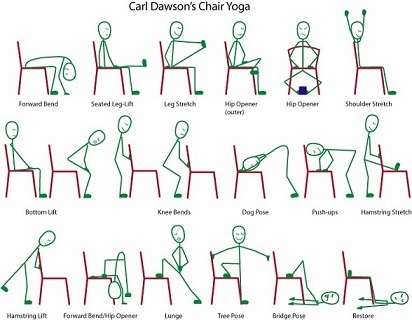 Take a look at Carl Dawson’s Chair Yoga picture below and have fun stretching!